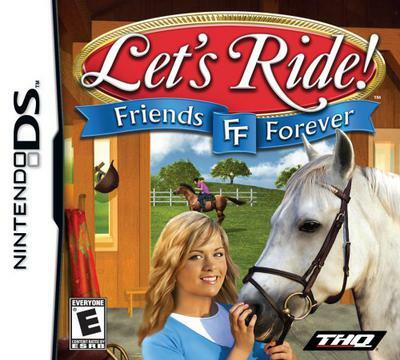 The game's plot: Every girl needs a best friend, and yours is your horse! Together, there’s nothing you can’t do. Practice hard-to-perfect riding and jumping skills as you prepare for the all-important regional jumping competitions. Go for the blue ribbon! I played it and found it awesome!!! Let's ride looks like a nice game but how much is the game? Right I looked on HorseCrazyGirls.com because I love horses very much even though my horse spirit died of colic. I was devastated he was trained well and he loved children also even babies he would gently put his nose near the baby. so the baby could touch him he was a really good horse when I saw him dead my heart broke into peaces when I saw him dead. Ok so here's the whole story. My cousin chellie went with my cousin jose to go to his house to use his internet well when they returned I went outside and got some grass to feed spirit. and when I got there he was dead he didn't show the symptoms at all he was fine in the morning. and in the afternoon he was dead my heart sunk he was like my partner for life or like my buddy I was sooooooooooooo devastated I stayed as strong as I could and didn't cry at all. I was so sad. If you feel sorry for me just go here and post. Oh no I think i'm going to cry. I just miss him sooooooooooooo much. I find this game a bit annoying. It took forever to muck out stalls and my horse got very sick so I had to start over! Also, the graphics are bad. I wouldn't recommend this game to people who like satisfaction. In my opinion, it's not a game worth buying.. It took me foreeevvveerr to muck stalls and my horse got sick alot! Also, there isn't much riding area and the graphics were... ehhhh very very basic. I'm not saying it's a horrid bad disgusting game, it's just not worth the price it is when you can get so so much better for the same price.